There are traditionally four historical capitals of China, collectively referred to as the "Four Great Ancient Capitals of China" (中国四大古都; 中國四大古都; Zhōngguó Sì Dà Gǔ Dū). The four are Beijing, Nanjing, Luoyang and Xi'an (Chang'an). As more new archaeological evidence began to be uncovered since the 1930s, other historical capitals have been included in the list. 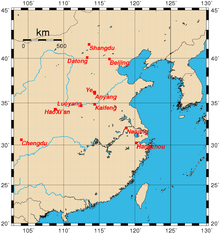 The phrase "Seven Ancient Capitals of China" now includes – in addition to the earlier four – Kaifeng (added in the 1920s), Hangzhou (added in the 1930s), and Anyang (added after 1988). In 2004, the China Ancient Capital Society officially included Zhengzhou as the eighth historical capital in light of new archaeological findings dating from the early Shang dynasty. Acheng District of the city of Harbin was the capital of the Jin dynasty from 1115 to 1153. It was called Shangjing (上京; Shàngjīng; "Upper Capital") or Huining Prefecture at the time. It was destroyed in 1157 and reestablished as a secondary capital in 1173. Anyang was the capital of the Shang dynasty roughly from 1600 BC until 1046 BC. It was called Yin (殷; Yīn). The state of Yan (11th century BC – 222 BC) in the Spring and Autumn period, when it was called Ji (蓟; 薊; Jì). The Liao dynasty (907–1125), when it was a secondary capital called Yanjing (燕京; Yānjīng; "Capital of Yan"). The Jin dynasty, from the 1160s to 1215, when it was called Zhongdu ("Central Capital"). The Yuan dynasty (1271–1368), when it was called Dadu (大都; Dàdū; "Great Capital") in Chinese, Daidu (direct translation from Chinese) in Mongolian, and Khanbaliq ("city of the Khan") in the Turkic languages. Marco Polo called it Cambuluc. The Ming dynasty, from 1403 to 1644, when it was called Shuntian Prefecture (顺天府; 順天府; Shùntiān Fǔ) and then later simply as Jingshi (京师; 京師; Jīngshī; "Capital"). Changchun or (Shinjin) was the capital of Manchuria during the Japanese occupation in WWII. Chengdu was the capital of the state of Shu Han (AD 221–263) during the Three Kingdoms period. It was also briefly the seat of the Nationalist government of the Republic of China in late 1949 towards the end of the Chinese Civil War. Chongqing (also romanised Chungking) was the provisional capital of the Nationalist government of the Republic of China during the Second Sino-Japanese War (1937–1945), and briefly the seat of the Nationalist government in late 1949 towards the end of the Chinese Civil War. The Taiping Heavenly Kingdom (1851–1864) during the Taiping Rebellion in the Qing dynasty, when it was called Tianjing (天京; Tiānjīng; "Heavenly Capital"). The Nationalist government of the Republic of China from 1928 to 1937, and then de jure since 1946 (de facto from 1946 to 1949). Taipei has been the de facto capital of Taiwan (the Republic of China) since 1949. Xanadu/Shangdu (上都; Shàngdū; "Upper Capital"), located northwest of present-day Dolon Nor in Inner Mongolia, was the summer capital of the Yuan dynasty. It was destroyed in 1369. Ye, located within the present-day city of Handan, was the capital of the Eastern Wei dynasty from AD 534 to 550, and the Northern Qi dynasty (AD 550–577). 1 2 Bamboo annals Xia chapter on Xia Jie under the name Gui (癸). 1 2 3 4 5 Esherick, Joseph. (2000). Remaking the Chinese City: Modernity and National Identity, 1900-1950. University of Hawaii Press. ISBN 0-8248-2518-7. ↑ Clark, Anne Biller. Clark, Anne Bolling. Klein, Donald. Klein, Donald Walker. (1971). Harvard Univ. Biographic Dictionary of Chinese communism. Original from the University of Michigan v.1. Digitized Dec 21, 2006. p 134.